Tickets have just gone on sale for a world class concert which is to be held on Battle of Britain Sunday, 20th September 2015, at Steyning Parish Church. The Steyning Battle of Britain Memorial Concert brings together an extraordinary group of international musicians. Amongst these is the soprano Sophie Bevan. She is at the forefront of a remarkable new generation of British singers. 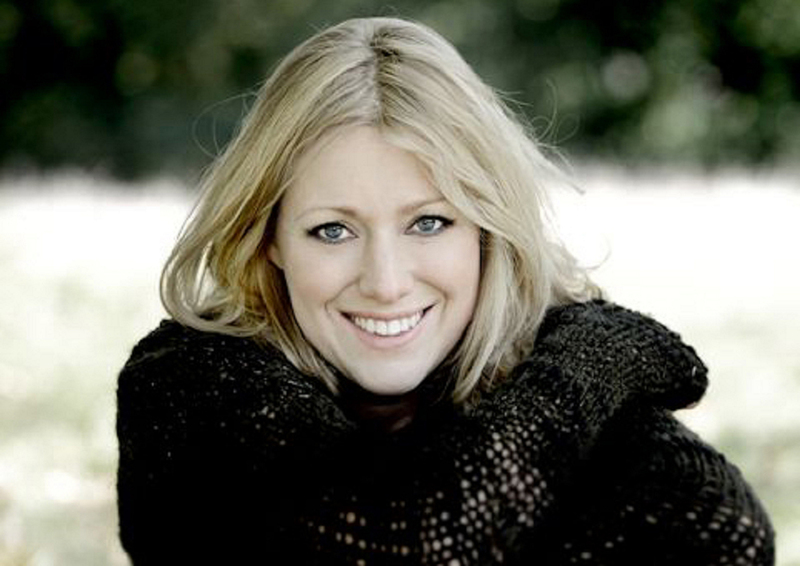 Sophie is no stranger to followers of the English National Opera and Glyndebourne festival with numerous leading roles. Together with her sister Mary Bevan we are delighted to be welcoming them at Steyning. Seventy-five years ago during the summer and autumn of 1940 the Battle of Britain was fought over the skies of Sussex and the South East of England. Civilisation and righteousness hung in the balance as our courageous young airmen took to the skies to defend our principles and freedoms. Winston Churchill famously remarked that “The gratitude of every home in our Island…goes out to the British airmen who, undaunted by odds, unwearied in their constant challenge and mortal danger, are turning the tide of the World War by their prowess and by their devotion. Never in the field of human conflict was so much owed by so many to so few.” I too have shared that great sense of gratitude. Through my childhood and professional life, both as auctioneer and priest, it has been my privilege to accompany the war time generation who largely remained open hearted and hopeful about the world, with a generosity inspired by their common experience. Following on from the great successes of this year’s Shipley Arts Festival, Andrew Bernardi and myself decided to organise a Battle of Britain Memorial Concert at Steyning Parish Church, where I serve, to honour the men and women of the RAF. Soloists including: Sophie Bevan (soprano), Mary Bevan (soprano), Andrew Bernardi (violin), Graham Salter (oboe), Bruce Martin (flute), together with the Bernardi Music Group and the Choir of Our Most Holy Redeemer, Chelsea, will be conducted by David Bevan. 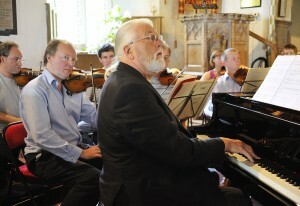 The concert builds on Steyning Parish Church’s strong musical tradition. The program begins with J.S. Bach’s Orchestral Suite no.2 in B minor BWV 1067 and Concerto for Violin and Oboe in D minor BWV 1060. An interval with Pimm’s will be followed by extracts from Mozart’s Mass in C minor. Mozart’s Mass in C minor K427 is generally regarded as one of his greatest choral works. He began it in celebration of his marriage but the piece was never completed. The Mass took Mozart’s unpredictable genius to new heights and is one of the most extraordinary pieces of sacred music ever written. It seems fitting that these pieces should be played in memory of and to honour all those who fought to save our island nation. The concert will conclude with a world premiere performance of ‘To Notice Such Things’ by the late Jon Lord, formerly of Deep Purple. Sponsored by Toovey’s and Spofforths, The Steyning Battle of Britain Concert will be held at 5.00pm on Battle of Britain Sunday, 20th September 2015, at Steyning Parish Church. Tickets priced at just £18.00 are on sale now through the Capitol Theatre Box Office. Go to www.thecapitolhorsham.com/whats-on/allshows/the-steyning-battle-of-britain-memorial-concert or telephone 01403 750220. By Revd. Rupert Toovey. Originally published on 19th August 2015 in the West Sussex Gazette. This weekend I shall be heading to the Weald & Downland Open Air Museum’s annual Vintage and Steam fair. 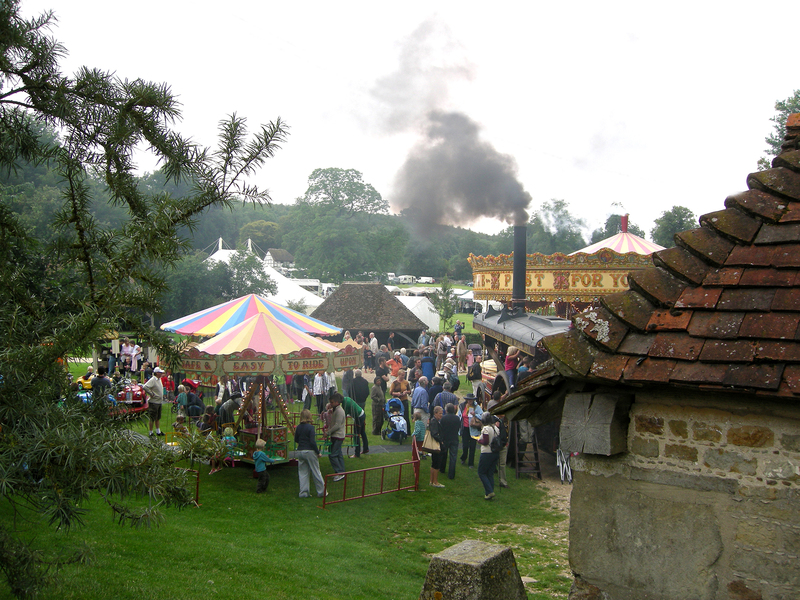 The museum’s collection of traditional buildings, set in the rural landscape of the South Downs National Park, will be brought to life by traction engines, vintage vehicles, a fairground and stalls. You can really imagine that you’ve stepped back in time with sights reminiscent of the 1930s and even earlier! 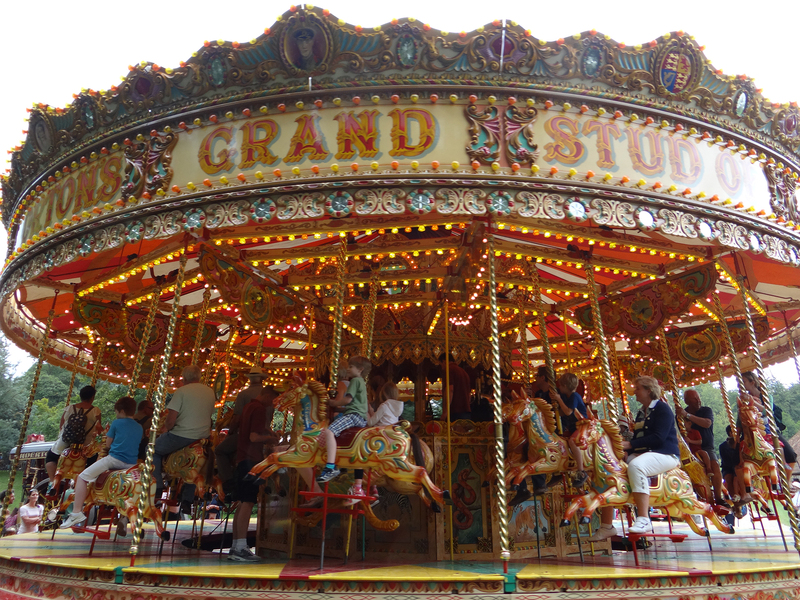 I love the scene depicted here with the gallopers roundabout powered by a Fowler Showman’s steam engine in the centre of a small traditional vintage fairground. It is a combination which always delights the senses; the sound and smell of steam and pistons, the colour and movement of the horses. At the heart of the museum’s work are some fifty buildings of national and international importance. They have been saved from demolition and neglect from across the South of England and reconstructed in this beautiful landscape at the heart of the South Downs National Park. Amongst my favourites is the medieval shop saved from Middle Street in Horsham which is thought to date from the 15th century. It was dismantled in 1967 to make way for redevelopment and the timbers given to the museum. After much research it was reconstructed in its current form copying a surviving shop front of similar date at Lingfield. Shops became increasingly common from the 14th century onwards. Goods were sold across the open counters like market stalls. Most of the buildings are open for visitors to go in and discover what it was like to live and work in them. 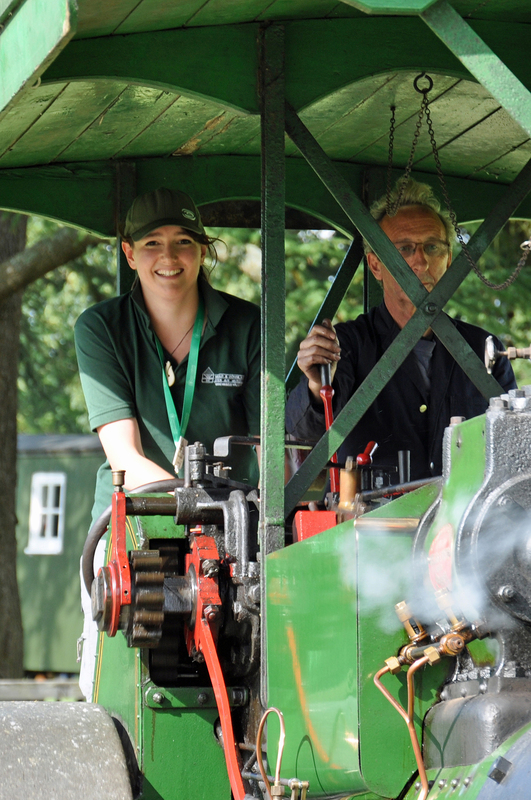 As you walk through the square and around the museum’s rural landscape you will discover traction engines working, local crafts, vintage music, a narrow gauge steam engine to ride on and very importantly a themed tea tent – something for all the family to enjoy! In the Events Field Arena there will be displays to enjoy including the St Giles horse drawn steam fire engine and the popular “steer a steam engine” shown here. On Sunday the Jaguar Enthusiasts’ Club from Portsmouth will add their regional annual meeting to the show, displaying marvellous cars from this fine British marque alongside other vintage cars, commercial and military vehicles. It occurs to me that we are all at least seventy years older than our years because the memories that an older generation shares with us seem real to us. Having lived in Sussex all my life I have listened to tales of traction engines at work in the fields, with teams of people and horses at harvest time, and of steam driven fairs. The stories have been told to me in the warm Sussex accent of an older generation which is sadly now fading. Their memories seem real to me in my imagination. It is as though they are my own. 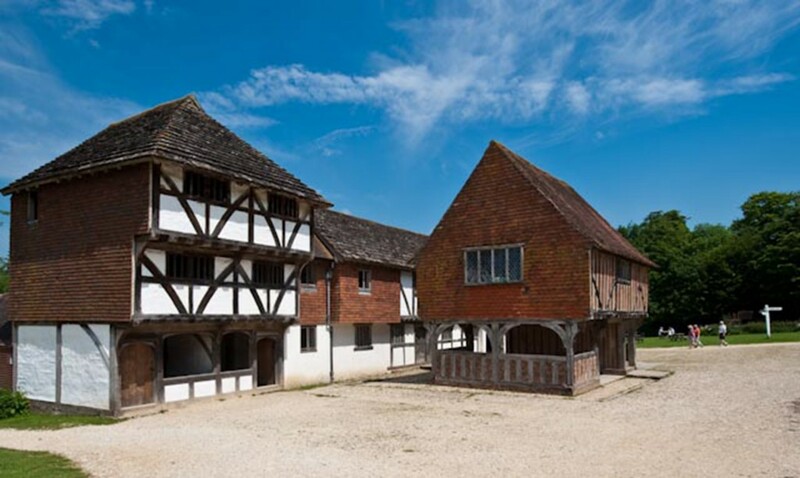 The wonderful work of the Weald & Downland Museum allows us all to inhabit and experience bygone ages. You cannot fail to be excited and learn about our social history, the common story which unites us, here in Sussex. 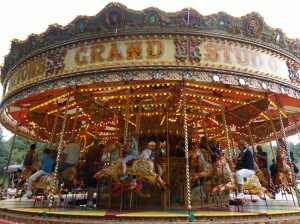 Visitors to the Vintage & Steam show will enjoy all the bustle and excitement of this traditional Steam Festival. It is being held at the Weald & Downland Open Air Museum, Singleton, near Chichester, West Sussex, PO18 0E, on Saturday 15th and Sunday 16th August, between 10.30am and 5.00pm. 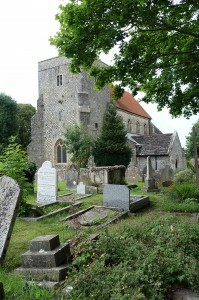 For more information go to www.wealddown.co.uk or telephone 01243 811348. Tickets are available on the gate – I hope to see you there! By Revd. Rupert Toovey. Originally published on 12th August 2015 in the West Sussex Gazette. This week I am once again at the Pallant House Gallery in Chichester for ‘Sickert in Dieppe’ which runs until 4th October 2015. This exemplary exhibition explores the formational relationship that Walter Sickert (1860-1942) had with the French seaside resort of Dieppe. For me this is a relevant and contemporary exhibition. Although Sickert’s paintings show us the life and scenes of Dieppe some hundred years ago, the vibrant seaside town he depicts is still recognizable to us today. We can feel the heat and shade of his pictures and pick out many of the same landmarks. The ambient sounds and life of the town that he captures speak to us across the years. 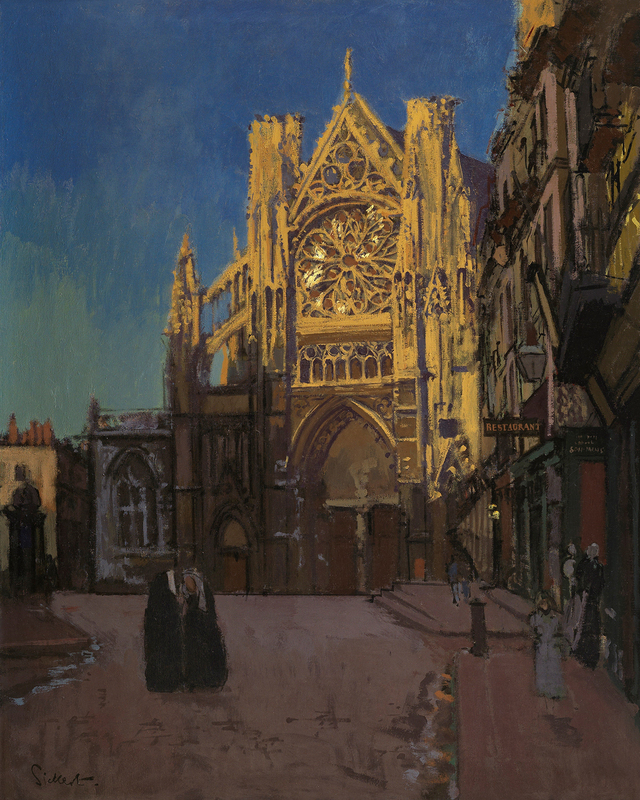 From his childhood, and for more than forty years, Sickert would return to Dieppe. The exhibition highlights the formative influence this vibrant seaside town had on the artist, and the extraordinary breadth of subjects he engaged with. He would produce a comprehensive topographical account of the town, its people and its environs. 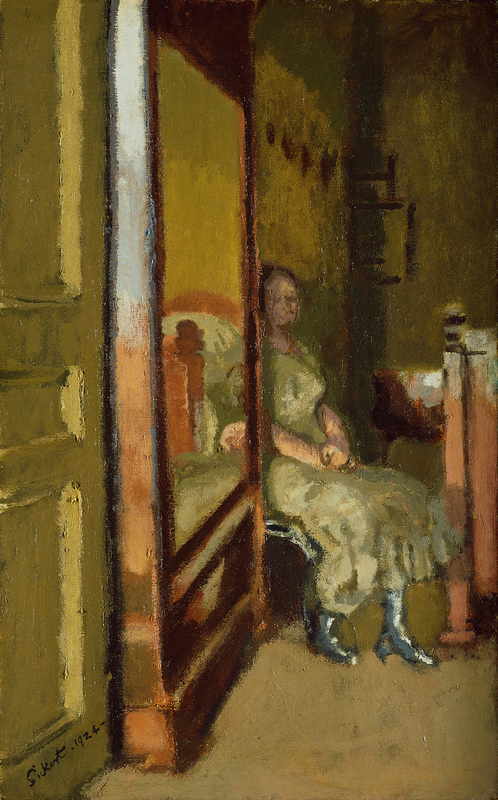 The work chosen for this show illustrates how Sickert’s work was influenced by his acquaintance with the French artist Edgar Degas and his closeness to Impressionist painters such as Claude Monet and Camille Pissarro. Encouraged by Degas Sickert started to emphasise what Katy Norris characterizes as ‘the everyday realism of his subjects…his paintings became more representational, based upon rigorously planned squared-up drawings and featuring strongly delineated architectural patterns.’ Influenced by Degas’ work Sickert broadened his range of subject matter to include the race course and circus scenes. The latter provided the forerunners to paintings like ‘Brighton Pierrots’ and his London music hall scenes. 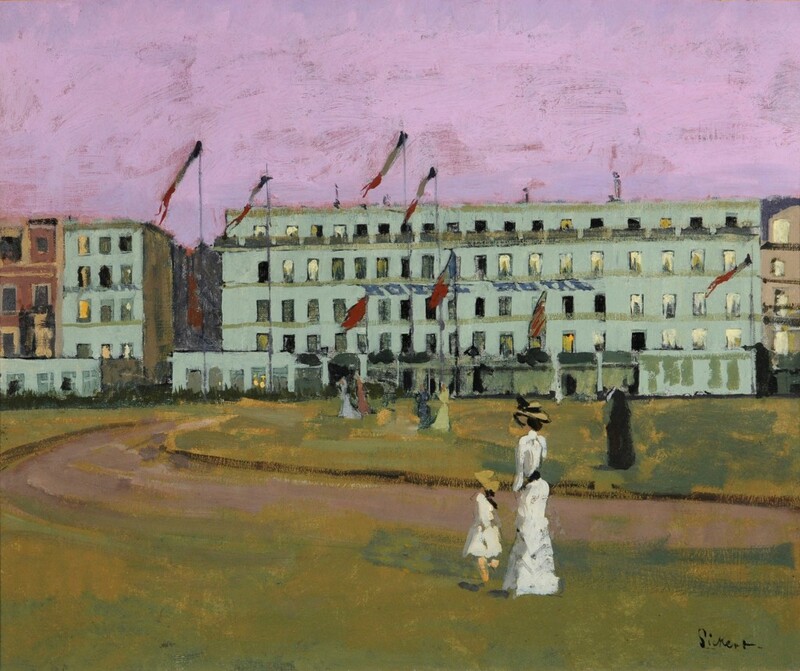 Painted in 1894, ‘L’Hotel Royal, Dieppe’ depicts what appears to be a public festival. The tricolour flags flutter in the coastal breeze. The figures and sea front hotel are depicted beneath the dramatic sky, turned purple by the light of the setting sun. Sickert left his first wife Ellen Cobden and settled with the local fisherwoman, Augustine Villain, in the suburb of Neuville. From here the narrow roads of the fishing community linked the Arcades de la Poissonnerie with the harbour and prosperous parts of Dieppe. These adjacent and contrasting architectural spaces fascinated Sickert. 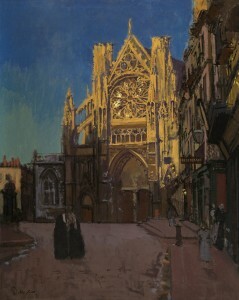 Take for example ‘The Façade of St Jacques’ painted in 1902. The bright palette and thickly worked paint shows some of the characteristic of Impressionist and Post-Impressionist painting but, unlike them, he did not work ‘en plein air’. In 1912 Sickert married Christine Angus Drummond. They made their home at the Villa d’Aumale in the valley of Eaulne, just ten miles from Dieppe. Katy points out that it was during this period that the artist developed his particular method of ‘applying the pigment in a patchwork of flattened layers of colour’. Sickert was cut off from Dieppe by the advent of the First World War. In the October of 1920 Christine lost her battle with tuberculosis and died. Sickert was overwhelmed by grief. 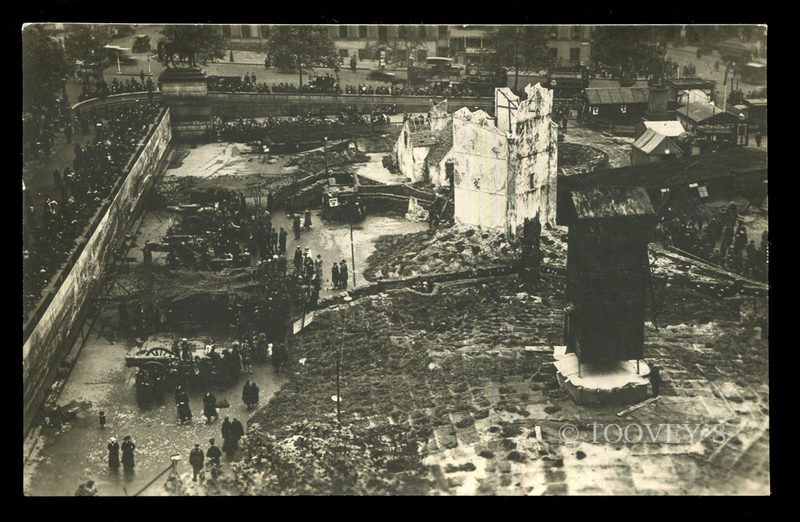 In 1921 he took a flat on the seafront at Dieppe. There he painted a series of pictures that he described as ‘figure subjects’. He posed different models in a poorly lit bedroom in his flat. There is a voyeuristic quality to ‘L’Armoire à Glace’ afforded by the composition. Separated by the doorway there is a lack of compassion and empathy between the artist and sitter. It has been suggested that a sexual under-current is implied by the empty bed reflected in the mirrored door of the wardrobe as though from a scene in a brothel. Sickert visited Brighton in 1913 where he made a speech at the opening of the important ‘English Post-Impressionists, Cubists and Others’ exhibition. Arranged by the Camden Town Group, it included work by him and many of the nation’s leading artists. He visited Brighton in 1914 with his wife and painted ‘Brighton Pierrots’ in 1915. 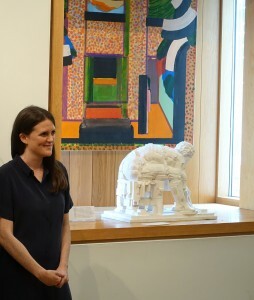 It seems appropriate, therefore, that ‘Sickert in Dieppe’ should be in Sussex at the Pallant House Gallery, 9 North Pallant, Chichester, PO19 1TJ, until 4th October 2015. For more information on ‘Sickert in Dieppe’ and the gallery’s current exhibition program go to www.pallant.org.uk or telephone 01243 774557. It is wonderful to see Katy Norris’ insight and assured vision expressed throughout this beautiful exhibition. I am proud that Toovey’s is among the headline sponsors of this insightful, relevant and contemporary exhibition. It should certainly be on your must see list this summer! By Revd. Rupert Toovey. Originally published on 5th August 2015 in the West Sussex Gazette. The current Pallant House Gallery exhibition ‘A Twist in Time: installations and interventions’ provides a remarkable opportunity to experience the conceptual, installation work of international artist, Michael Petry, here in Sussex. Michael Petry’s art draws inspiration from both classical mythology and contemporary culture. He seeks to give expression to our human relationship and interaction with the world, combining a sensual physicality with a reflective spirituality. Michael has a deep awareness of the importance of narrative and place. He involves the viewer in playful narratives rooting them, for a moment, in time and space. We are invited to inhabit the work in our imaginations; to become aware of changes in light, shadow and colour as each moment in time evolves, gifting these installations with life and movement. And there is a conscious relationship between the specific architectural setting and the work. 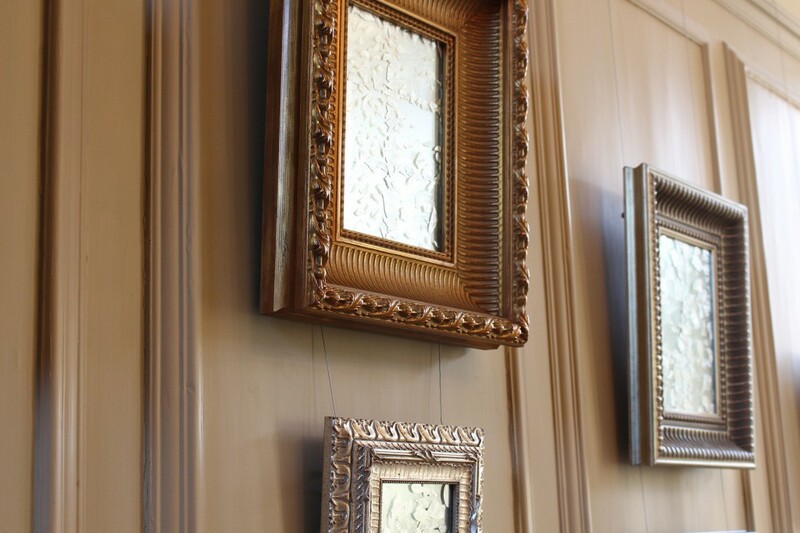 Reflections are at the heart of Petry’s ‘Bad Restoration’. This installation looks at both the imperfect way we seek to restore our physical image and our flawed reflections in mirrors. The fragmented, layered, mirrored glass of the artist’s mirrors seems to reflect something of the nature of modern life while echoing Oscar Wilde’s story ‘The Picture of Dorian Gray’. 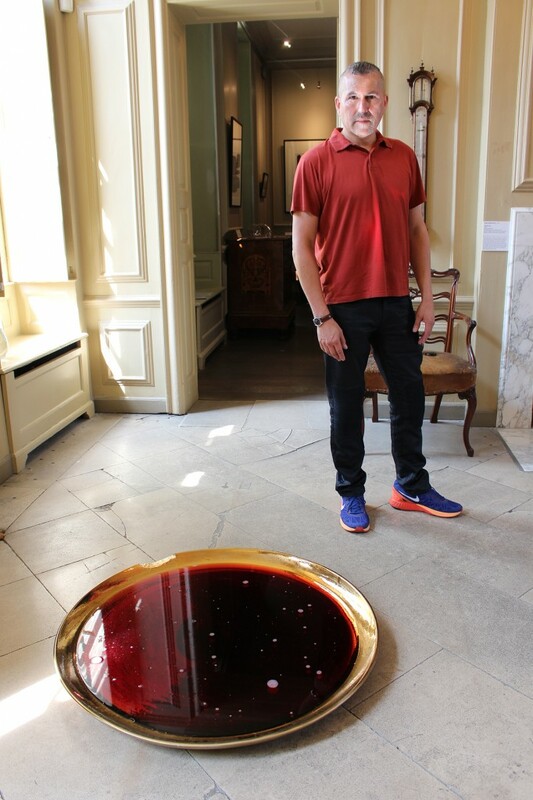 As we turn towards ‘A Twist in Time’ the gallery’s wall is bathed in the reflected red of the wine. Much of Michael Petry’s work explores the vitality and non-functional properties of glass transforming the use of this material from utility to art. Petry describes glass as a “luscious material”. He continues to redefine the distinction between artist and artisan. Michael often works collaboratively with highly skilled craftspeople to create his works. He is keen to identify the role of the students and staff at Plymouth College of Art in the making of the glass components for the installation ‘A Twist in Time’. He describes how ‘A Twist in Time’ responds to the architecture of the 18th century house which forms part of Pallant House Gallery. 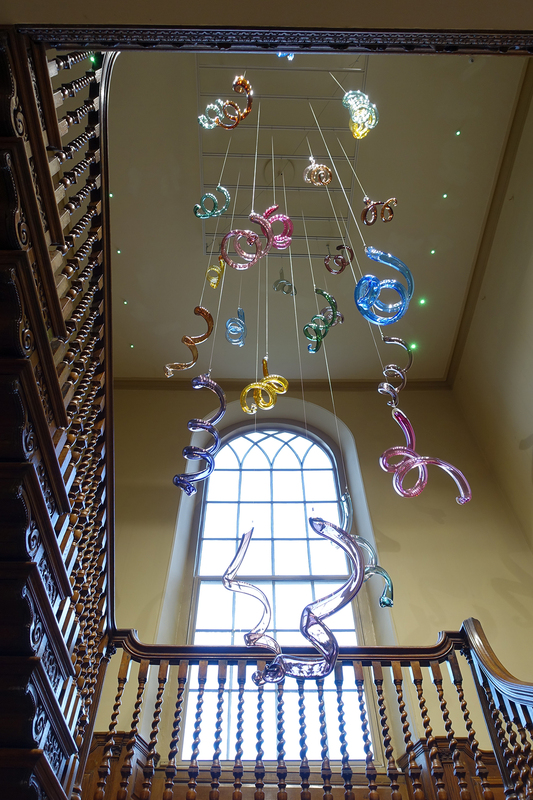 Michael says “I really wanted it to have a reference to these turned columns on the stairs.” The delicate barley twist spindles on the elegant staircase are reflected in the glass spindles suspended, as if floating, in its well. The colours do not fully reveal themselves until you reach the landing where the light from the large arched window gives them life. Michael talks of playing with the tranquil colours of the space. The green spiral ties in with the trees which can be seen in the courtyard garden, the brown reflects the timber of the spindles. It is a work created to be in dialogue with the building and our senses. As visitors move up and down the staircase the boards creak giving voice to another of Michael’s narratives, this time about ghosts revealing themselves in the house. As you walk through the rooms on the upper floor unexpected clear glass objects, which the artist calls ‘Ghosts’, reveal themselves to you. This intentional artist challenges our perception of the world and the ‘lenses’ through which we view it. There is honesty and beauty in Michael Petry’s art. His observation of the world and our humanity reveals a rare depth of thinking and compassion. Here the ambiguities of life and death, strength and gentleness are held in tension. This is a must see show. ‘A Twist in Time: installations and interventions’ runs until 1st March 2016 at Pallant House Gallery, 9 North Pallant, Chichester, PO19 1TJ, telephone 01243 774557. To see video extracts of Rupert Toovey’s interview with the artist Michael Petry click here. By Revd. Rupert Toovey. Originally published on 26th July 2015 in the West Sussex Gazette.